For applications where precise measuring of a motors' rotor position is critical, a Stepper Motor is the best choice. Stepper motors operate differently from other motors; rather than voltage being applied and the rotor spinning smoothly, stepper motors turn on a series of electrical pulses to the motor's windings. Each pulse rotates the rotor by an exact degree. These pulses are called "steps", hence the name "stepper motor". 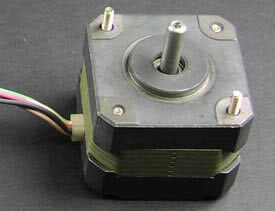 The degrees per pulse is set in the motor's manufacturing, and is provided in the spec sheets for that motor. They can range from ultra-fine movements of a fraction of a degree (i.e., 0.10 degrees), to larger steps (i.e. 62.5 degrees). This article will explain the operating principals of stepper motors, and will give instructions on how to control them via a PIC16F84 microcontroller to perform many functions.